I know that the father… told me that the Amish he is with believe they are supposed to be the light of the world but that they should not try and blind a person’s eyes with the light. They are supposed to let their light/actions show who they are. Other than the youth sing-a-longs that took place for [a recovering family member] where they sang some Christian songs, it is almost non-existent that this family brings God into the conversations. While I am happy that they are not out to preach to me like some religions do, it is so far the other way that I wonder how important God is really to them. An outsider might think that because the Amish dress as they do that this is a sign of their deep love of God. I wonder how many Amish just go along to get along because that’s all they know. Even on one to one talks with them I don’t hear that their main goal is God driven. So I am left to wonder what this all means. Others have made similar observations. My first thought is that I can understand the sense of contrast, especially considering how freely religion is discussed in American public life. Examples of that abound–pro athletes who reference the Lord’s aid in post-game interviews, politicians whose “God-talk” ratchets up a notch in certain precincts, or even religious bumper stickers which do the talking for drivers. “Shining a light”, but not blinding the other person, is something you often hear in Amish circles. “The concept of spreading the faith primarily through words strikes the Amish as hollow,” write the authors of The Amish Way: Patient Faith in a Perilous World. “They believe that the best way to judge a person’s faith is to see it lived in context, in community” (The Amish Way, p. 43). I’d add that some Amish are more forward about speaking about religious matters than others. As a rule, New Order Amish tend to be more vocal in this area. Those I know seem to make a point of regularly bringing up issues of faith. Other of my Amish friends are more “delicate” (for lack of a better word) about how they bring up religious topics, but over time they do come up. However, this may be a factor of how well I know those families. What do you think? What have you observed? 58 responses to Why don’t Amish talk about God more often? You know that St. Francis never said that, right? Kevin, I have always loved that quote, and actually, when I think of it the Amish often come to mind for me. I think many of them, especially in tourist areas, have an image to uphold, so keeping their head down and going along with all the rules is an unspoken requirement. Don’t rock the boat, ya know. I’m sure many of them have plenty of questions, and ponder different views in all the time they spend working and not talking. (I have found, I think best while working alone. )But outside the faith, and not with many inside the faith, they wouldn’t normally just open up and willingly have a theological discussion or debate. It’s not in their nature to preach, or to argue (debate)… but to ponder. This is in my experience with Amish. 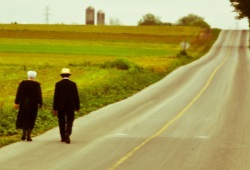 Amish humility: a welcome counterpoint! I value the contrasting approach of the Amish. American society is so infused with marketing and Hollywood-inspired “values” as to make the quiet Amish humility an incredibly welcome counterpoint. We have lost an appreciation for subtlety on many levels. I tend to appreciate that humility all the more when I observe Amish families in public – something that actually increases my faith in the truth of the values they live out. The aggressive “sales” tactics that certain others use can be a sore turn-off. I do have great admiration of how the Amish separate themselves from the world, but I am also wary that they follow their practice not out of a Biblical conviction to be separate from the world but instead out of a false, works-based form of righteousness. The gospel of Christ is the grace of God through faith alone, not of works, and there are times when it seems that the Amish follow a isolationism that, without a Scripturally-convicted basis grounding it, becomes just another way to try to earn your way to heaven. Jesus was humble, quiet and not wordy when in public. He led a life of quiet humble service. Those who lived this kind of life Ghandi, Mother Teresa, St Francis, etc. are to be emulated if they are to witness. The Amish are better at it than most other denominations. An outsider meets an Amish person, asks him or her lots of questions about the Amish lifestyle, asks questions about the Amish faith, and then proceeds to debate religious tenets. The Amish are not interested in defending their faith to outsiders. Like Erik pointed out, the lower (more conservative) Amish are even more unlikely to enter in, or continue in, these types of discussions. In my experience, God permeates every aspect of their daily lives; beyond that, many continue on to develop deep, personal relationships with God. This also factors into the controversies we’ve seen over things like not using SMV triangles and the like. Outsiders try to take this on by arguing but the response is not to get into an argument. It’s what we believe, and that is that. This is one of the many reasons that you have the New Order Amish, the Old Order Amish, the Beachy Amish and so on. With any of the folks I’ve known over the years, at the end of the day you know where their heart is even if they don’t constantly talk about it. So “Midwestern reader” is questioning their faith because they didn’t spend enough time proselytizing? How many minutes per hour or hours per day does someone have to give lip-service to God to prove that He is really important to them? Did their God-talk come up Short when he was expecting Venti? I frequently come across the most inspiring examples of Godly living and attitudes in the pages of Family Life magazine. I am curious as to what percentage of Amish families receive and read this publication. I know that many in the Amish settlement closest to where I live consider Family Life to be too worldly. If my family knew of a community that fully embraced the positions in this magazine, and was also interested in accepting outsiders, the chances that we would look into joining such a community are pretty good. Sounds like they are on the traditional side if they feel Family Life is too worldly. I’m not sure about current circulation; a source online puts it at around 30,000 in 2010 but I recently heard from someone in the industry that it is not that high (maybe it has dipped with the growth of other publications). Not all of those Family Life subscribers are Old Order Amish either. By my rough estimate there are around 60,000 Amish households in North America. These numbers are not perfect but can give you something to think about. I think it reaches many Amish, maybe not the majority of households but many of them, especially those with children as many parents consider it good wholesome reading material to have around the home. Thanks for that info., as well as for responding to my comment, which I realized may have seemed pretty off-topic. Family Life came to my mind immediately because faith related issues are frequently discussed. I wonder if in some communities the rate of subscribership is quite high, or if it is more by family preference across all communities. It would also be interesting to know the percentage of non-mennonite background subscribers, vs. conservative mennonites, Beachys, Amish, etc. It strongly promotes very plain, agrarian living (at least in the older issues that I have access to) so I would expect it to be popular among plainer communities, but it seems to be rejected by some more conservative Amish, perhaps because of the record of some former writers/editors, such as Elmo Stoll. Obviously, I am waiting for someone to do a research paper on this subject! I’m not commenting except saying that I’m waiting to see what conclusions most of these comments will contain. I like your idea to write a short comment in order to read all the other comments to come in. I also want to say I really appreciate the statements regarding, “shining a light without blinding others’ eyes”. Very good theology in my book. What do our opinions matter? Ask an Amishman, or two!, and get back to us. I’d say it matters for different reasons–one is that it’s worth it for the discussion, for examining how we think or talk about faith. I also like to hear others’ observations and experiences. There are a lot of Amish individuals out there in a lot of different communities. Amish have been asked, and as Terry Berger touches on in the comment above, have different rationale and approaches to this question. I think most would agree with the “let your light shine…” concept. The Amish Way is a recommended read for this and other Amish faith topics. They dig into this and other topics to a greater depth with commentary from bishops, ministers, and lay people. I think most Amish believe that everything they do, is in service to God & speaks to others about living a clean wholesome Christian life.. For them to go around proselytizing (great word Robin, thanks) brings up hockmut..which is arrogance and something they strive to remove from their being. They arent any different than any other people.. some feel a closer connection to Our Maker than others do.. Until we walk hand in hand with someone for a long period of time,and have their complete trust & respect, we cant truly know where their hearts lay. 1. Being plain and humble people, I suspect that perhaps they take “not being proud” to a new extreme. In other words, they choose not to be boastful of God albeit their very way of life is based on His teachings. 2. Being Anabaptists, they profess that they will not be baptized in the church until they are old enough to make that decision for themselves on whether to stay in the church or not. That being said, perhaps, they feel that it is not up to them to talk to others about God, because, each individual makes his or her own choice on whether to accept God or not. 3. I have heard it said, yet I have no factual proof, that the German used in their Bibles is not the same that they use in everyday life. As the years have past, the Old German has changed. Thus, teenagers and young adults can’t even read, let alone understand and profess the Word of God, thus, they just go with what the elders tell them or do. Mike, interesting thoughts, just a couple of comments. On #1, for the most part they don’t seek converts–part of the thinking is that actively seeking converts would suggest that they feel their way is the best way for all. I have heard it said by an Amish person that, paraphrased–it is not best for everyone to be Amish, but it is the best way for me. There is a humility there. On the other hand, humans are humans and I won’t say I haven’t detected a hint of pride, or self-righteousness on occasion from Amish people I’ve spoken with. More an individual thing than a blanket attitude though. #3–The German in the Bibles Amish use is High German, and the language of daily life is Pennsylvania German or Pennsylvania Dutch. Children grow up with Pennsylvania Dutch but they learn German in school. They are not as adept in the German as they are in PA Dutch or I think in a lot, even most cases, English. The Bibles Amish use often have the German on one side (Martin Luther) and the King James English on the facing page. When my grandfathers estate was settled in 1973 there were 4 bibles. One was an English bible. I completely agree with your comment that they “go along to get along”. Many of my amish friends have no idea why things are the way that they are, but they would never rock the boat by questioning, as that could cast them into suspicion. Personally, I think that many dont discuss God more, especially with non-amish, as they dont want to be drawn into discussion. Also, depending on Order, there are some variances in belief. A person commented above, saying they don’t want to rock the boat, they don’t pray and they don’t even know what’s going on…. That TRULY sounds like an Amish person who was confronted with many judgemental questions. Instead of getting into a debate or argument, they would rather avoid the question or even the conversation. Also, I have noticed with the younger children…if I speak English too fast, or if they don’t know how to translate the words they want to say into English they just say that they don’t know. Also they say they don’t know if it would take too long to explain. They do this out of humility, not out of laziness or because they don’t care. More power to the Amish. It is so refreshing to see people actually live the word, rather than talk about it, or shove it in someone’s face. May they grow in number. Hmmm, I’ve found the old saying–Amish?–to be largely true: It’s the empty wagon that makes the most noise. From my own personal interactions with Amish friends, I’ve always had to bring up the subject of God/religion but they won’t hesitate to let me know when/where church is. I believe most Amish would agree that their religious experiences are just that-Amish religious experiences. Not for Englishers. But a shared faith that leads down two separate paths still has many things in common. With the hope of reaching the same destination. With that being said, I think the Amish are too humble and self conscious about drawing other people into a discussion not everyone would like let alone feel comfortable talking about. John a good point–it is not uncommon for Amish people to invite outsiders to church. If I didn’t know anything about the Amish, that would probably surprise me (especially if I were going on the stereotype of the “closed, secretive Amish” that circulates). You are invited to participate and made to feel welcome. I have always appreciated that. I do know someone who attended a service of a very conservative Amish church. He was invited by church leadership, but from how he described it people were sort of surprised to see him there. I don’t think they get as many visitors. Sure was an interesting read…as they say. My 2 cents worth now, and this is, an example. The Amish don’t kiss their spouse in public and always part by saying they love each other. I am fine with whomever who does so, but when you compare the divorces among the non-sayers and the always-sayers…. do you get my drift? Amish friends; there is a lot of food for thought in that book. If I wasn’t clued in or not paying attention, I might miss what “Now, let’s put that where it belongs” is supposed to mean. I think we often dont realize that non-English first language speakers dont speak the same way we do, even if they’re extremely proficient in English.. I’ve seen it many times over the years. I’ve been attending an Amish Mennonite church and many of them are ex-Amish. I’ve heard them mention several times that one of the reasons they converted from Amish was because they found that the Amish life was becoming more of a lifestyle and less Christian. –Kind of like how some people are Jewish, but not practicing Jews. I guess many mainstream Christians are the same way! I’m sure that it isn’t in all cases and was also their perspective of the situation. If only each and every other religion lived by the same standard of not blinding others with their “light” (faith), just think of how many unnecessary wars, murders,land grabs, etc., would have been avoided throughout history? I have always enjoyed discussing scriptures with my Amish friends. I met my first Amish friends in 1999. I was visiting them because we both breed Morgan Horses. The husband is a Bishop in the Nappanee area. We talked about their faith and he let me read the German bible. I was very rusty in my German. (My Granpa spoke German when I was a child.) I now have Amish friends from Ohio to Colorado. They have given me their Faith books and the “dual” bible. I have several pathways pamplets, 1001 questions, “Our heritage, hope and faith” and the Unser Leit history set. I know enough German & Amish to get myself in trouble! My September 2013 visit to my closest friends in Nappanee ( my age late 40’s) in which the husband is a Decon, ended up with me at church! I was surprised at how much I understood. Of all my church visits over my life and my Mum raising my sisters and I JW’s I felt more in my heart than anyplace including when I was baptised a Jw, of which I haven’t gone in over 18yrs. The only thing I felt in my JW baptism was wet… When I told my sis in MT about that she wasn’t surprised. She said everyone finds God differently. My entire family has said as long as I remember that I should have been born 200 years ago. I feel home when I am with them. Over the last 5yrs since my Mum passed I have prayed for God to show me where to go. Last Thanksgiving I told my Daed & sisters that I would like to learn more about the Amish faith and possibly join. Now I definitely want to join. My friends I went to church with has a Bishop friend here in CO that he told me to write to and visit. We’ll see how that goes. I have already given away clothing and made my own dresses from fabric I hadn’t used for 20 years for church dresses. I use candles and veg oil lamps. I ride my bike to work more than I use to. I don’t have home internet and don’t watch tv. I won’t miss a thing! Wishing you the very best, Elizabeth.. God indeed does speak to us all differently. My friends & family too think I should have been born a hundred + years ago.. so do I, however I incorporate what I like and make the most of my world. When I was younger, I wanted to run away & join the Amish.. I’d have converted well back when.. Im not sure I would now that Im in my 50s.. I do like my creature comforts.. mainly electricity, my kitchen gadgets, and my electric washer & dryer.. If I had to, I could survive and survive well without electricity.. but I doubt that will happen.. I also feel I should have been at home in the late 18th century…sort of! By that I mean I like to do the “slow way” of things, to be resourceful, and to able to be self-reliant/ self-sufficient. On the other hand, one of the “messages” of Amish living is to live within community. It is an act of humility before God and your fellow man to avoid being completely (or even mostly) self-sufficient. That said, I’ve tried to be less vain with my appearance, use what resources I have wisely, and to be a better steward of the property I own. Now, I “just” have to find a community! There have been a lot of great ideas in reply to Erik’s article. I for one like the “We’ll put that in its place” variation of the English phrase. I got to thinking though, how much of the influence on the modern approach to non-verbal “preaching” might still be rooted in the formational days of the earliest Anabaptists and Mennonites, especially the oppression the earliest believers experienced, and perhaps felt a need to keep things “under wraps” perhaps. I do agree with you SHO Man.. I can certainly understand how that would be a huge influence since much about their way of life has been handed down for hundreds of years.. The aversion goes beyond that and includes references to prayer. Never have I heard an Amish person ask anyone for a prayer need or say they are praying about something. I too have wondered about that. When you say never have you heard an Amish person ask for prayer or told to pray for one. Do you lump all non-Amish into the same boat? I am Amish and often ask for prayer and am told to pray for others. I am not New Order, but Old Order. So I hope this helps you be more open-minded about this subject. All said out od respect for my fellow man. From my viewpoint : Amish Faith in God is REAL ! If we wouldn’t believe in God what would be the point of living this way. I know people are saying we just follow the rules to uphold a certain image, to go along to get along, not rocking the boat, which I totally disagree with. That’s not saying there might not be some folks who do. But the whole essence of a plain and simple life is following God’s word. Nonconformity, humility, modest dress, discipleship, a simple lifestyle, loving thy neighbor, not judging others – all those and more have scriptural backing. One reason I would give for an Amish man not starting a conversation about God is to not get into an argument and also since he speaks and thinks in the PA German dialect and reads in High German, what he has to say about God might not be portrayed clearly and will therefore sound stilted and unconvincing to a non-Amish person. Try initiating the conversation, but not in a confrontational manner. You would often be surprised at the depth of the average Amish man’s beliefs. So much said out of love for my fellowman ! Sorry I’m rather late on this post and got a bit long-winded. Thank you, Amish Girl Rebecca! I think it’s much more important to live it rather than give lip service (Lippedienscht=nicht gut!!!) to loving the Lord. My friends and I often spoke of the Lord, just not to make the other person somehow feel bad or try to sway them. About being long-winded: I don’t feel you were at all. You wrote eloquently and from the heart, and I for one appreciated what you wrote. I wish to you and your loved ones a blessed Christmas and a healthy, happy new year. Rebecca, that was so well said! I often would like to comment on these and hold back for fear I don’t say it right! Thank-you so much! Just don’t get the “nonconformity” thing. Isn’t dictating width of hat brims and seam widths the ultimate conformity? I don’t want to step into Rebecca’s comment, but the nonconformity issue is “nonconformity to the world.” Just my two-cents. Carol, the “nonconformity” is not a dictation, it is a fence to keep predators out. If we have some guidelines and are asked to be conservative, in our dress, modest and all that, which differs in areas, that is not a DICTATION, but a cocoon of protection. it is there to help us watch how far we go, and to remind us who we are, not better than you, not holier than thou, but reminded that we did promise to abide by the Amish standards when we were babtized and said yes to the question. Why don't the Amish bring up God so often? I don’t know that they feel the need to talk all the time about what is in their hearts. They would rather show it by living it. That is my impression. I was visiting my friends last year, and their nephew came in. We were talking about something, and I said, well, we all love the Lord, to which everyone nodded and smiled. I’m Baptist (originally Evangelisch and used to be able to worship in German every Sunday here in Pittsburgh–oh how I miss those days! I was the last one to serve as organist for the German services, right up until we didn’t have enough people coming any more). Once when we discussed worshipping in German, I told my friend’s wife how fortunate she is. She replied she didn’t have the opportunity to learn High German, so she took her KJV (which my Church uses as well) to Church and used it. I replied (quoting a Rabbi whom I knew years back when he wanted people not well versed in Hebrew to feel at home): God understands English too!! The Rabbi used to say, by the way, “God is MINIMALLY Bilingual!” I always liked that. Pray in the language you love best, I always say. At any rate, we had wonderful, God-centered discussions, and no one tried to convert the other to their way of thinking. Be kind, gentle and open your heart and ears to realize they do love the Lord and I’m sure your friends will be happy to talk with you. A note for those unfamiliar: “The Master” refers to a Taoist, put simply. “Those who know don’t talk. I really like that! For some reason it reminds me of something I overheard once where a very aggressive Christian was asking a local girl, “Are you saved?” She replied, “Don’t ask me, ask the people I live with, work with, and worship with.” I liked that — the idea a person can say or claim anything but one’s life will “say” much more. I have an Amish Ferrier. I got to know his family and now I run a little store by their house! I buy used and new thrift items, the items that they tell me they are looking for. If I bring up the subject, he and his wife are MORE than happy to talk about God. We talk about having faith about today, tomorrow and the future. We laugh at the weather forecasting (they guess, but God knows!!!). When I worry, she reminds me : more worry means less faith, more faith means less worry! I see their father reading stories out of the Bible to the children every afternoon after lunch. They pray before and after every meal, but not in public. When I apologized about not praying in public, she said that they felt the same way…you shouldn’t boast in public. They are saddened by the way young people act and treat their parents, but they don’t scold anyone…. They lower their head and say that it’s SO SAD. I think they say a quick prayer for that person. I adore them! Leave a reply to Why don’t Amish talk about God more often?